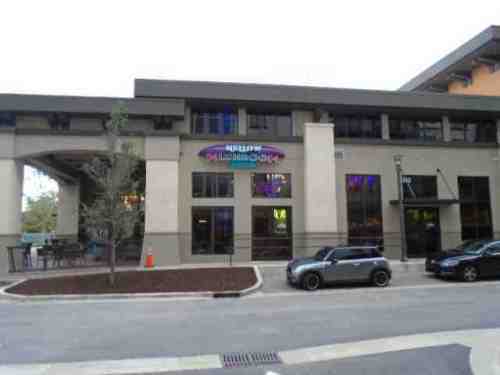 MELLOW MUSHROOM is the latest member of the franchise that started in Atlanta. It is a huge whimsical location at the new Flagler Village complex. Parking is sort of a puzzle though I heard there is valet parking in the evening. An employee told us that they would be building a garage across the street--that’s across busy Federal Highway--which is far from a workable solution. The restaurant is bright, large with comfortable booths and tables, ever changing colored big mobiles all over the place and a very interesting kegs of beer setup. I am still trying to figure out why a restaurant referring to mushrooms would have an ’under the sea’ theme. Their menu is basically made up of Italian items concentrating on pizzas with calzones, hoagies and salads. We ordered one chicken calzone ($12.99) and one steak calzone ($12.99) with intentions to share. I wasn’t sure whether a single calzone is always served in two sections or the server ordered it that way for us so we could share easily and each plate was completely filled. While pizzas come in three sizes the calzone is priced based on a small one. I, a big eater, would suggest one be ordered and shared. We had a diet soda ($2.49) each. The server was excellent, checking back to make sure everything was okay, refilling drinks without being asked and answering our questions, like about the beer kegs and parking, with a smile. With tax and tip the check came to $40 for lunch. Okay I talked about everything except how the calzone tasted. The ‘fresh Mellow dough’ was heavy and ‘doughy’. The filling consisted of mozzarella cheese, peppers, onions, mushrooms and the meat, the latter very spare. It was served with a side of nondescript red sauce. All in all with all the Italian restaurants in Fort Lauderdale I wouldn’t recommend the Mellow Mushroom for a calzone. With the lack, and confusion, of the parking situation with the Flagler Village complex garage consisting of ‘for residents only’, ‘parking for take out’ and a few handicap spaces, along with what we tasted and saw served, Mellow Mushroom is not for me but then I am not the type of customer they need/want to succeed.